Charles V - of Spain appointed Antonia De Mendoza as Viceroy. One of his early priorities was exploration. Having heard of the fabulous Seven Cities of Cibola Mendoza organized an expedition to take a look assigning Francisco Vazquez de Coronado the task - as it worked out, Coronado was unable to fulfill his assignment. Mendoza had more success establishing educational institutions. Mendoza succeeded in many of his responsibilities. I didn't really know this stuff but a quick search on-line gives such great details. Staying with the thread, Melchor Diaz was involved in supplying Coronado. Quite correct... Diaz reached the Colorado Delta (by land) soon after Hernando de Alarcón sailed there, canoed up the Coronado and back, and left. This freed-up Melchior Diaz to explore California as they realized they could not reach the Coronado Expedition with the supplies they carried. Melchior Diaz was the first Spaniard to travel to California, by land. Without finding his grave in California, that honor is not affirmed. In my chapter 'California Discovered' (pages 3-5), I list all the expeditions of the 1500s. They traveled some years ago into the side canyon of Arrajal. Entered the side canyon at 31 25.43, -115 20.273 and drove to where it was no longer passable at 31 26.050, -115 24.094. Wornout in his sand rail and Lou in his Bronco. Not sure if both rigs were used or just one? I am now encouraged to retrace their path. PaulW, can you expand on this? Who was Wornout and Lou? When was this, since you mention a Bronco, which I am guessing you mean a Ford Bronco it was at least after the mid 1960"s? Can others look over these archives? Based on the history of the area (it has way more use and history than I first suspected) I believe that the rock-pile was not Diaz's grave, but who knows. There was a spurt of sheep hunting in the area in the early 1900's so my guess is that it was a blind or something along those lines. Finding cleared rock circles high above the arroyo shows that even though there is a serious lack of water in the area it was still used quite a bit. Along with old fire pits, what appear to be sleeping walls and modified caves in some of the smaller draws points to a lot of human activity. I have also come across old cans, pottery and car parts (all in different spots) in remote areas where there with no clear trails which again point to historic use. Wornout and bajalou were Nomads. Lou left this planet not long after our lost mission search in 2011. Their trip to the Sierra Pinta would have been in the 2000s, I think? Paul, links to those posts would be nice. Wornout and Lou are San Felipe residents from about 20+ years. Lou drove a full size 90s+ Ford Bronco. These guys along with many others pioneered most all the trails in the area. Lou a good friend, passed away a couple of years ago and we all miss him. Wornout is an active offroader and leads trips usually once a week or more. Many of their trips like the one mentioned above have never been repeated. Baja has so much cool stuff to offer! "4x4 track you can take" (from where to where)? Where is this drug runner airstrip (there are so many)? The airstrip is probably the one at 31-23.685x115-20.200. The trail along there was used in a couple of SF 250 races. The turnoff on Hwy 3 is about a mile west of the road that goes down to Diablo Dry Lake. That is the way I went out on my last trip into that area, out past the large ditched runway to Hwy 3. Not sure if it is the 4x4 one referred to because after the runway I recall passing 1 or 2 other tracks that headed south. I probably have the gps track on google earth. Saw a large bobcat in one of the washes. That landing strip has now become a silt bed. Now days we drive around it slowly. Yes, there are some ditches made by the military. The track Harald posted can be driven in an SUV and a Tacoma pickup from Hwy 3 to 5, but not the leg shown to Hwy3. That leg goes to Borrego and is really gnarly. The road from Hwy3 in addition to leading to the landing strip is also called the slate mine road. Enter close to Km169 at a fenced gate. The valley beyond had cattle at times which is why it is fenced. What TWM posted is what I drove on one of the several trips in the area. Went in at his KM179 several times. Also went in and out off of Hwy 5 a couple of times, somewhere around 10 miles north of the Hwy 3 and 5 junction. Went out where TMW has H3 marked, that we are all talking about, once and still not sure if that is what 4x4abc is referring to though. That runway has ditches every 50 to 100 feet at least on the western end. I walked it to the end and found a couple of old campsites and there was probably 15 ditches on that half. Can you do another map post of the one above but show further north from the points you call "here?" and "CAMP 1 WRONG WASH" please? It's hard to tell exactly the location of your routes in relation to the search area unless you include Arroyo Grande as the rock pile was on a side wash draining down (west) to Arroyo Grande from the highpoint of the Sierra Pinta range, according to the person who found it (Walter Henderson). I would like to know which arroyo from the Score race course is the correct one to attempt driving to get as close to the highpoint of the Sierra Pinta. Sure, Arroyo Grande is just right of the center at top of the image. Ok thanks. No need to include all the area past Arroyo Grande. Just trying to see the possible routes to get in there or what you have been able to drive up. 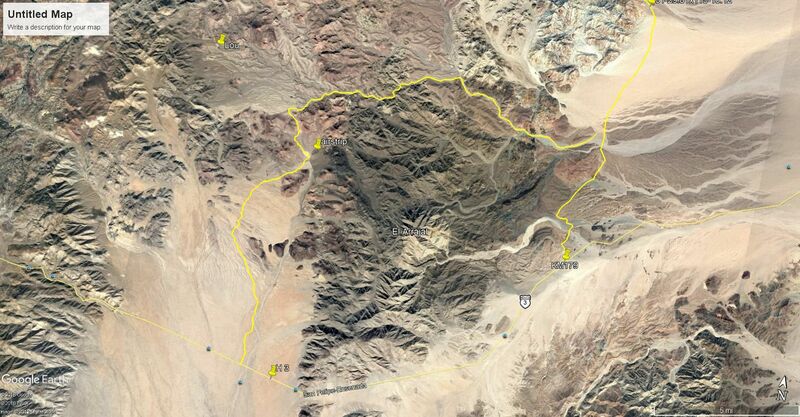 Is the yellow a line the best guess for Walter's hike? Yes the yellow lines was just a guess of his possible route. You can drive quite a ways up some of the washes going northward off of Arroyo Arrajal which you place you within day hikes of Arroyo Grande southward of my yellow line.